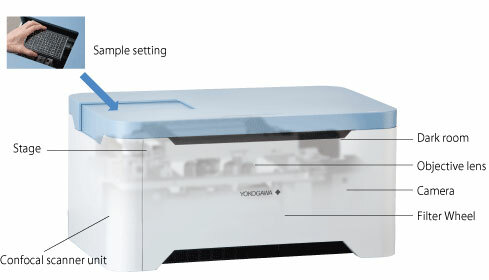 Compact design contains fully integrated multiple functions to offer easy-to-handle confocal imaging system, without a need for complicated system integration; you only need to set a sample and run the software. User-friendly interface and versatile functions support your measurement and analysis. 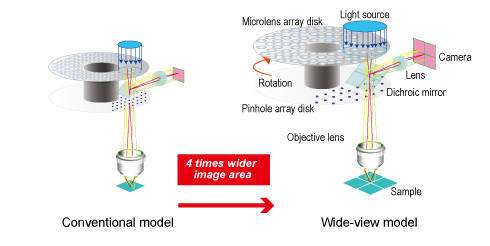 A Nipkow spinning disk containing about 20,000 pinholes and a subsidiary spinning disk containing the same number of microlenses to focus excitation laser light into each corresponding pinhole are mechanically fixed on a motor, and very rapidly rotated. 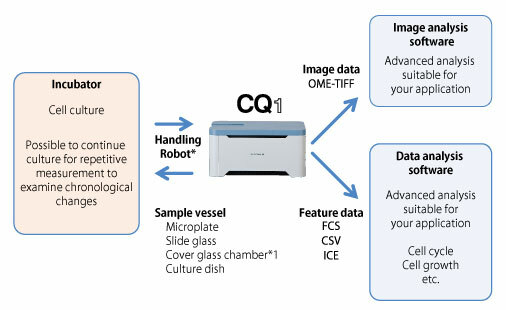 As a result, high-speed raster scan of the excitation lights on the specimen can be achieved.The pinhole and microlenses are arranged on each disk in our proprietary design to optimize raster scan. Multi-beam scanning not only increases scanning speed, but also results in significantly lower photobleaching and phototoxicity, because multi-beam excitation needs only low level of laser power on the specimen to fully excite fluorescence.